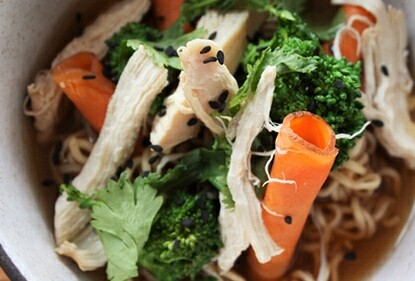 This Turkey Ramen is another smart and satisfying use for Thanksgiving leftovers. 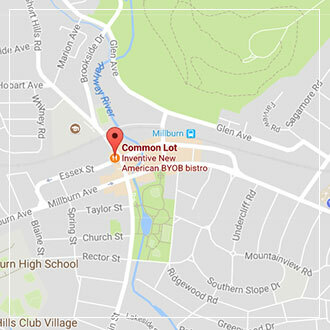 It comes to us from Common Lot in Millburn, NJ, a new globally inspired but locally focused restaurant from husband/wife duo Ehren and Nadine Ryan launching in early 2016. Pre-heat oven to 380F. Place leftover turkey carcass (picked of all its meat) into oven and roast till golden brown. Place roasted carcass in a large heavy base pot and add all remaining ingredients. Bring to a simmer. Allow to simmer for 30 minutes to infuse broth. Cool in pot for about 30 minutes. Strain broth using sieve and discard the solids. This master stock may be kept in freezer for months. If running low, top up with fresh chicken stock and fresh herbs and spices. This stock gets better with age. The flavors intensify after each use. Can be used for poached chicken, braised pork belly and others. Just bring to boil before each use and remember to top up so you can use it again.